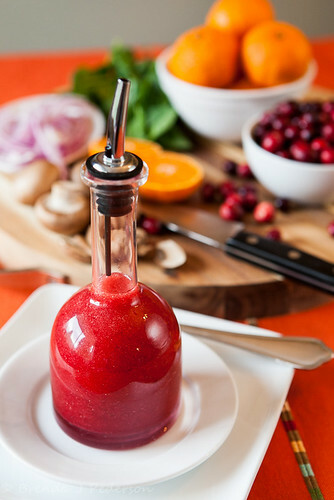 I love this salad dressing recipe and am rarely without it once fresh cranberries appear in the grocery store. Not only is it delicious, but the color is vibrant and cheery – a perfect way to brighten gray autumn or winter days. Over the years it’s become a family favorite. Whenever I’m responsible for the green salad for Thanksgiving dinner this is the salad dressing that’s requested. I think this year I’ll use spinach as the base for the salad; add finely sliced red onions; sliced mushrooms; pieces of Satsuma; and sweet-spicy walnuts. The original recipe is from a really great cookbook (you’ll love all the recipes), Dishing with Kathy Casey: Food, Fun, and Cocktails from Seattle’s Culinary Diva. If you are looking for a holiday gift for someone who loves to cook this is a good option! Place cranberries, sugar and vinegar in small saucepan and heat over medium heat until cranberries pop, 5 – 10 minutes. Let cranberries cool slightly and then transfer to a blender. Puree (being careful to make sure the top doesn’t pop off if they are still warm) the mixture until fairly smooth – there will still be pieces of bright red skin. Add the mustard and Satsuma juice and lightly mix. Transfer the mixture to a medium bowl. Slowly, slowly add the oil while continuously whisking until all oil has been incorporated and the mixture is emulsified. * Use any sort of orange-flavored citrus you have on hand. The original recipe called for orange juice but I love the tang of tangerine or satsuma!